Frogged by Vivian Vande Velde. Review: Can you imagine what it would be like to be a frog? Frogged written by Vivian Vande Velde is a great book that gives readers a glimpse into the life of a frog. Princess Imogene's life changes, when a boy tricks her into kissing him. That's when it happens, and she turns into a frog! Imogene has never been a frog before, so she doesn't know what to do. She just wants to go home. After Imogene becomes a frog, she realized that a spell by a witch is what caused her transformation. The only way to turn back to normal is to kiss someone else who would then become a frog in her place. When she sets out to find the witch, a huge misunderstanding occurs. A group of boys and a girl that perform a traveling acting show don't believe that Imogene is actually a princess. They make her a part of their group. That is a big problem for Imogene because the longer she is with them, the farther she gets from her home. During the story she tries many times to escape, but it doesn't work out. I really enjoyed Frogged. Just when you think everything is back to normal, something happens that messes everything up. This book has so many twists and turns that it seemed like the problems would never get solved. I never wanted to stop reading; it held my interest the whole time. I recommend this book to middle school girls. The larger quantity of characters make the story more interesting because the more characters, the more conflict. I also liked the setting of this story because it's different. Instead of happening in a random town like most stories, it happens in a kingdom. I really like Princess Imogene in this book because she is sneaky but truthful at the same time, plus she is also nice. She's smart and clever and has so many character traits that I can't even name them all. Frogged is an interesting story about becoming a frog. This book was really fun to read, and I really liked it. We would like to thank Houghton Mifflin Harcourt for providing a copy of Frogged for this review. 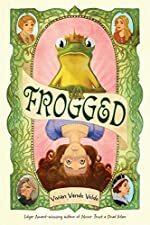 Have you read Frogged? How would you rate it?